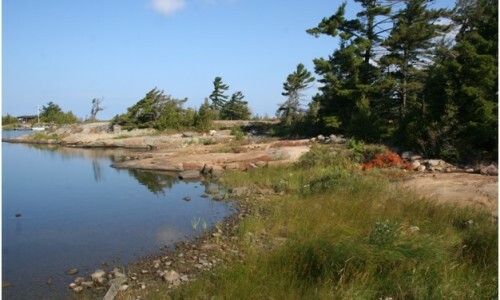 The Loudon property is a small island in the dense central cottage area of Pointe au Baril. Its vegetation community types are predominantly white pine and mixed hardwood forest with interspersed areas of open and shrub rock barrens, especially along the shoreline. Several small areas of meadow marsh are present along the less exposed areas of the shore; this is ideal habitat for the local reptile species at risk. There is also an area of floating-leaved shallow aquatic wetland that is dry during low water cycles. There has been an active merlin nest (small falcon) observed on the property.